Submitted by Evelyn Kiefer on Mon, 09/04/2006 - 00:44. So you think you would not last a day on Project Run Way? Maybe you never learned to sew or maybe you are the creative type but fashion is just not your media? This past Friday I realized anyone can make "wearable art." Tie-dying is easy, no sketching, cutting or sewing, most of the process is left up to chance. Park Works (a great oganization that brings fun events to Cleveland parks) held a tie-dye event at Fairview Park near where I live in Ohio City. Park Works made it easy; they provided free white t-shirts, coolers of cold water for soaking the shirts, rubber bands and rubber gloves and bottles of dyes in every color you could want. A few friendly people were there to help you through the process. 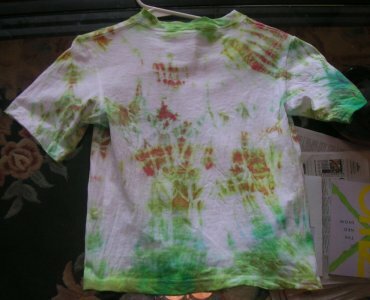 The last time I made a tie-dye t-shirt I was in high school. I had forgotten how fun it was to see the results of your rubber banding and color selection. About fifty people were there when I showed up over an hour after the event started. The playground at Fairview Park was the perfect place to wait while your t-shirt soaked. I made this little t-shirt for my son. And don't think tie-dye is just for aging hippies! Here is a little information on the history of tie-dying; its very interesting, people have been doing tie-dye in various forms for 1000s of years all over the world in places like China, Egypt, India and Nigeria.